If you are looking to get one of the last batch Lancer Evolution X's - the one good car that Mitsubishi makes - you will be better off opting for the older 2014 model, even if that means not getting the GS-R "Final Edition." There is a reason for this: As if the Lancer's interior wasn't terrible enough - the last model year of the Evo X will NOT come equipped with those fabulous Recaros. 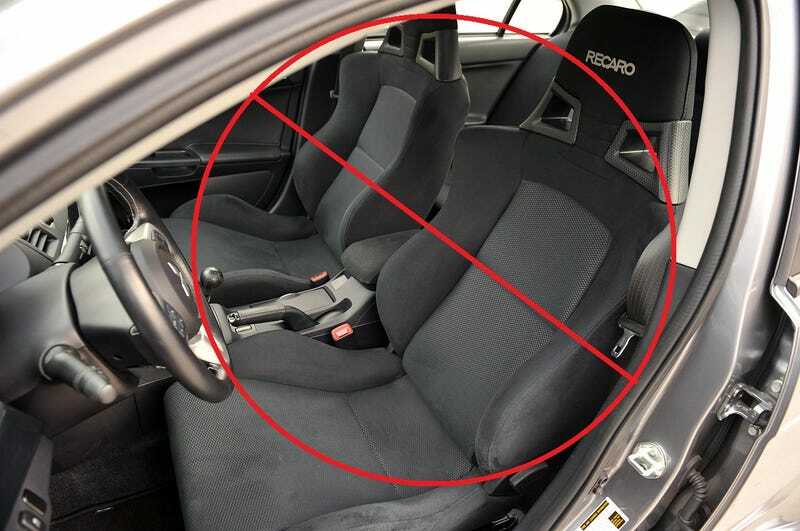 As you can plainly see, the comfortable, snug and supportive Recaros with big bolsters have been replaced by the economy seats straight out of a $16,000 CVT-equipped Lancer ES or whatever the hell it's called. It turns out that DOT has more stringent side airbag regulations in place for 2015 - regulations that the Recaros that have been present in the Evo for seven model years did not pass. Mitsubishi had no choice but to pull the lovely Recaros - the one bright spot in what is otherwise one of the worst, most plasticky and awful interiors in existence. But I still want a 2015 Evo for some reason...what do I do? Of course, $1800 per seat is not chump change. "But hey, no problem" you figure, "The '15 Evolution should be several thousand cheaper since it doesn't have an expensive pair of Recaros in it." Well, that would make sense...except you would be wrong! So in a nutshell, Mitsubishi is charging you $310 for the privilege of removing those lousy Recaros from your car. It's almost like Mitsubishi is copying the Porsche model of charging you more for a decontented GT3 model...except Porsche takes out the crap you don't want, and leaves the good seats in the car.